The facility was gorgeous and well maintained. The staff is welcoming, knowledgable and extremely attentive to any needs on the premises as well as with activities and restaurants off site. We loved everything about this place. From the minute we arrived until the minute we left, we felt like we were family. Our private villa with its own pool and jacuzzi was beautiful and very relaxing. We loved the gorgeous view overlooking the Caldera. Every morning we had a lovely breakfast of our choosing delivered to our villa. The staff, especially Corinna and Stella, made our stay outstanding. We can’t wait to go back. Everything. The view of the caldera is unparalleled and the quality, attentiveness and consideration shown by the staff and management of the Santorini Princess is the best we've ever experienced. Carina, Stella, Dmitris, Nastassia and everyone we encountered were kind, interested in our enjoyment and a pleasure to get to know. if you are considering a trip to Santorini and wondering where to stay then look no further and book the Santorini Princess. We are so glad that we were not jammed into a tiny space in Oia, Fira or the other towns and, instead, had the spacious 3 bedroom, 3 bathroom villa with private pool and yard at the Santorini Princess. The most gracious and helpful staff I have ever encountered at a property. Truly made us all feel like royalty. The staff was fantastic! I have never had a more personal experience with a facility. Private villa overlooking the water. Breakfast was amazing. Best romantic and relaxing getaway for my husband and I. Beautiful villas in a lovely quite part of Greece. Excellent service staff fantastic would definitely stay here again. It’s isolated from the busy areas perfect for honeymooners! Great view! Eat here as the chef is awesome! If you want to be pampered and waited on this is the perfect place for you! Exceptional service and Staff were very very accommodating with all our request. Villa was extremely clean and modern with stunning views of the caldera/ sunsets. We felt like royalty and had a very relaxing experience, the staff were very friendly and helpful. This hotel has a high level of service, staffs and facilities. Lock in a great price for Santorini Princess Presidential Suites – rated 9.7 by recent guests! 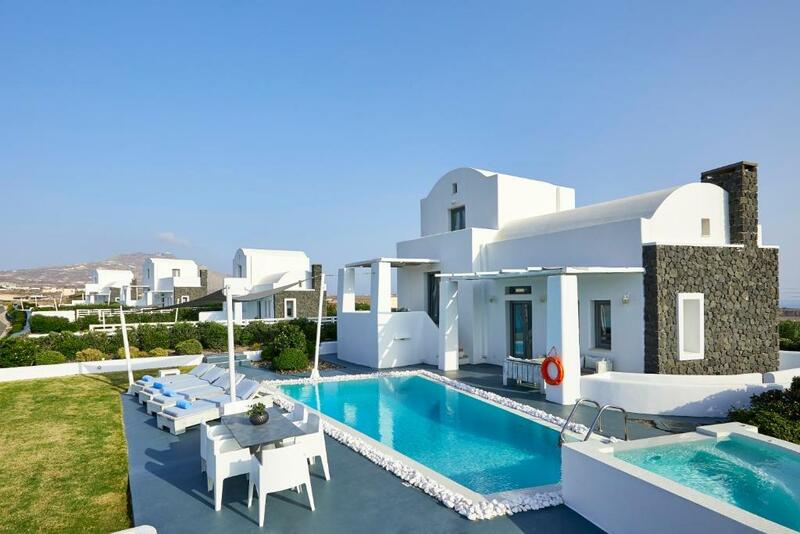 Santorini Princess Presidential Suites This rating is a reflection of how the property compares to the industry standard when it comes to price, facilities and services available. It's based on a self-evaluation by the property. Use this rating to help choose your stay! 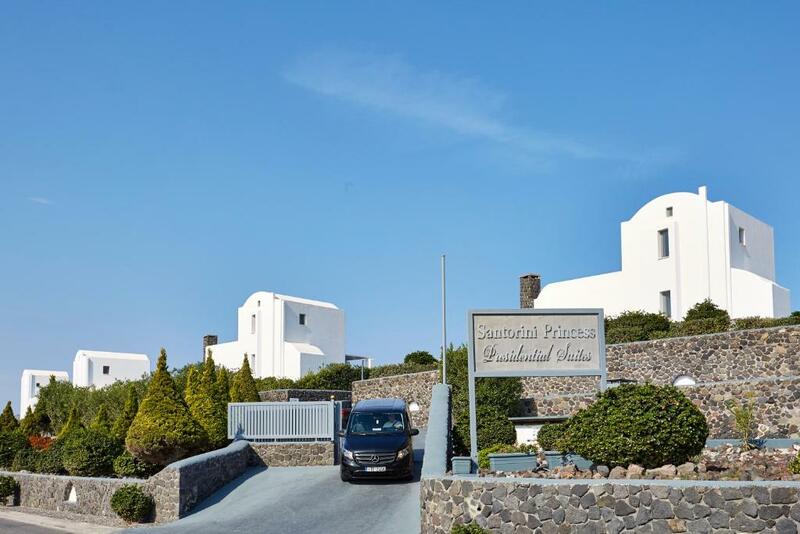 The Santorini Princess Presidential Suites is in Akrotiri village. Its accommodations have a private pool, hot tub and large furnished terrace with panoramic views of the Aegean Sea and the Caldera. Wi-Fi is free throughout. Modernly designed although conserving the traditional Cycladic-style, these units are very spacious. Each villa consists of a sitting area, fireplace, 3 bedrooms and 3 bathrooms, each with a spa tub. They feature a 32”LCD satellite TV, DVD/CD player, laptop, minibar and safe. Breakfast is prepared daily and served in the privacy of your suite. Guests can also enjoy the room service that is accessible. The 24-hour front desk can provide information on local attractions and beaches such as the Red beach which is nearby. Cleaning services are available daily. There is also a tennis court on site. Spa treatments can also be arranged on site upon request. 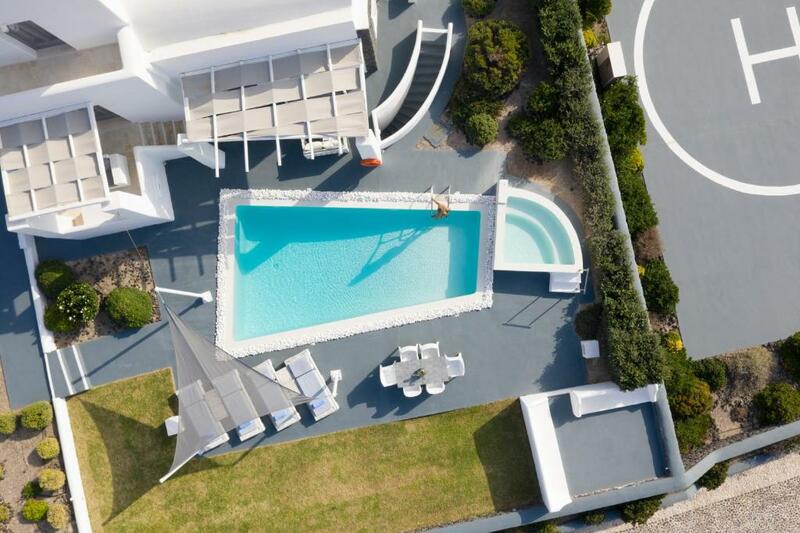 Santorini Princess Presidential Suites is 5.5 miles from the lively town of Fira. The port of Santorini is 4 miles from the property, whereas Santorini Airport is 6 miles away. Shuttle services to and/or from the airport/port and to the rest of the island can be arranged upon request and for an additional fee. When would you like to stay at Santorini Princess Presidential Suites? An iron is available upon request. Each villa is divided in 3 floors: the living room is on the ground floor, while the bedrooms and bathrooms are on the 1st floor, ground floor and semi-underground level. The area of Akrotiri is one of the upcoming areas in the island and it offers a panoramic view of the island and the volcano. Here, our suites, give you the space and feeling to enjoy moments of sheer relaxation, while enjoying the view that made Santorini famous. House Rules Santorini Princess Presidential Suites takes special requests – add in the next step! Santorini Princess Presidential Suites accepts these cards and reserves the right to temporarily hold an amount prior to arrival. Please note that the pool in each villa is heated in May and in October. Very expensive .... ! Aud $900 a day! Exchange rate will cost you dearly, A day will cost approx 550 euro plus you have to pay for transfers and water etc, this is a complete luxury hotel highly recommend for couples not so much children. Nothing !!!! although the showers are a little small. Showers were a bit small. We really enjoyed our stay. Nothing was too much. Delicious breakfast and beautiful view. We arrived before check-in time, but we could enjoy the swimmingpool at the other hotel for a few hours, they even drived us to it and back! Very good service!